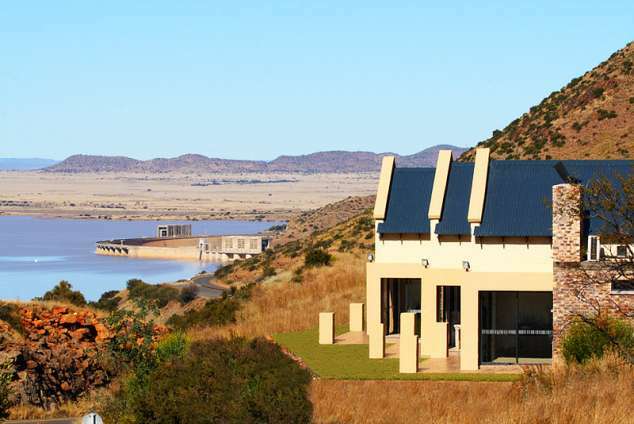 Adamsview - Gariep and Dam Accommodation. Welcome to Adamsview Accommodation in Gariep Dam. The Gariep dam view can be seen from the bed, spar bath, fire place, kitchen and private braai area. Air conditioning and DSTV in all the rooms, Spar baths in two of luxury units and self standing baths in the bedrooms of the other luxury units. Three luxury units with private braai facilities, full kitchen, spectacular dam views and separate entrances that enhance privacy and gives a sense of ownership. Luxury loft with air conditioning, DSTV, Spar bath, shower, full kitchen and a patio overlooking Gariep Dam. All meals can be arranged by prior arrangement from a four star hotel only 200m away. All rooms are spacious and extend the feeling of freedom. From Johannesburg via Bloemfontein, From the N1 take the exit toward R701 (Gariep Dam), Turn Left onto the R701, Turn left onto the R33 (at Shall garage), Continue straight on R33 go pass Food Zone (on the right) and Forever Resorts (on the left), Make a sharp right turn into Loerie st and go up the mountain. Take the first turn left. You will see us! From Cape Town, Stay on the N1 pass Colesberg and take the exit toward R701 (Gariep Dam), Turn Right onto the R701, Turn left onto the R33 (at Shall garage), Continue straight on R33 go pass Food Zone (on the right) and Forever Resorts (on the left), Make a sharp right turn into Loerie st and go up the mountain. Take the first turn left. You will see us! From Port Elizabeth via Steynsburg, Venterstad, drive on the R58 and turn Right onto R701, Go over the Gariep Dam wall and turn Right at the stop onto the R33, Take a sharp left unto Loerie St going up the mountain. Take the first turn left. You will see us! From Port Elizabeth via Colesberg stay on the N1 and take the exit toward R701 (Gariep Dam), Turn Right onto the R701, Turn left onto the R33 (at Shall garage), Continue straight on R33 go pass Food Zone (on the right) and Forever Resorts (on the left), Make a sharp right turn into Loerie st and go up the mountain. Take the first turn left. You will see us! 17580 page views since 17 Oct, 2011.